From the very first moment I stepped foot on Cable Beach I was fascinated with the perfectly breaking waves on the beach. They certainly weren’t big, though people were surfing them with large surfboards, but they broke perfectly, and made great subjects. I’ve taken a couple hundred shots of the waves up there but I really liked this one because there was just so much drama in the clouds. Also the overcast conditions really enhanced the beautiful colour of the water. I genuinely really miss Cable Beach. There was nothing more relaxing than just wondering up and down the beach and capturing it in its many different moods. Someday we’ll catch up again. This entry was posted in Australian Landscapes and tagged australian landscape photography, broome, broome tourism, cable beach, cable beach broome, canon 17mm TSE, landscape photography australia, surf photography, wave photography, western australia. Very clean wave indeed mate and nicely composed image as well mate! Fantastic seal of approval from Mr Stitch. Thanks Mark. You’ve been quite this weekend haven’t you? Avalon Point on Saturday hanging 10 on my big mal and Strikos today for a nice cruisey session! 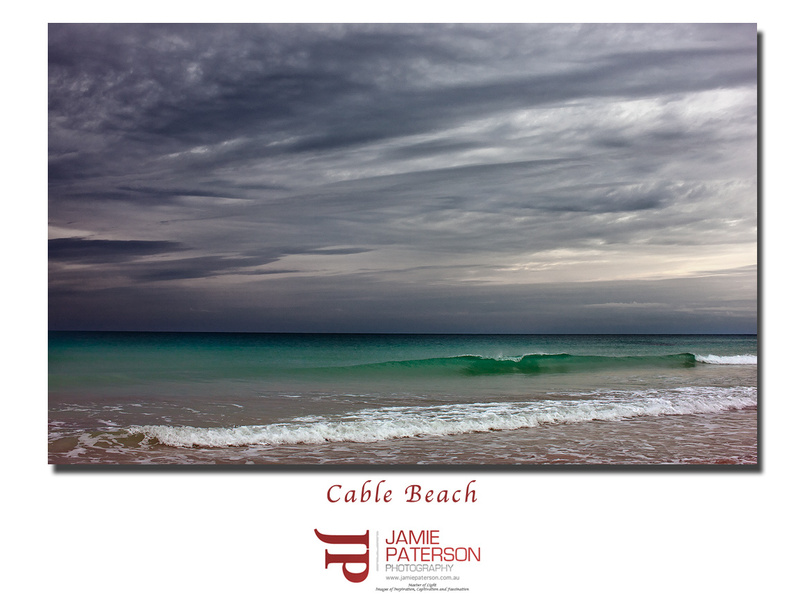 Great shot Jamie, I love the clouds and the colour of the water is awesome. Hi Andrea, I’ve got a few more shots of these waves to display shortly but they are all blue sky ones. This one really jumped out at me. Yeh well I see why Jamie, it’s nice to have something different with the sky. Thanks Tony. Wish I was there now!